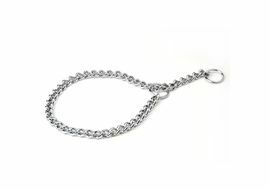 Choke chains are customized chained collars (preferably used for dogs) that are made to fit loosely and can be customized to tighten it to exercise adequate control over the pet. Over the past few decades choke chains too have undergone a facelift when pet owners wanted to add more substance to hone the personality of their dogs. 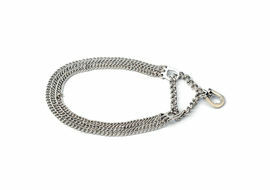 That’s how choke chains started coming in different styles. 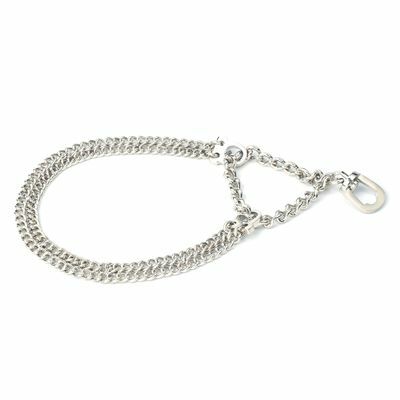 In simple terms when two ends of traditional choke chains are affixed to an external loop it’s called as a Semi Choke Chain. 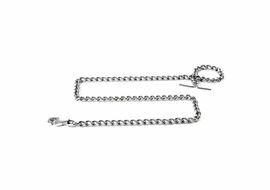 A double simple choke chain has 2 set of chains affixed to an external loop. The high quality stainless steel is polished with chrome plating to give that dynamic look to your pet. 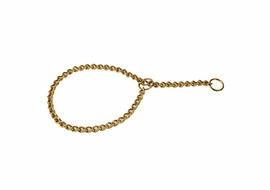 You would seldom find a police dog or bomb squad dog without a choke chain around its neck. This product is made as per international safety norms and avoids all kinds of choking hazards. 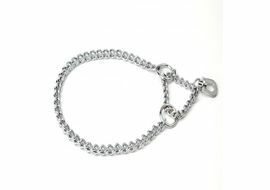 Each end of the choke chain has a circular ring which varies in its diameter. 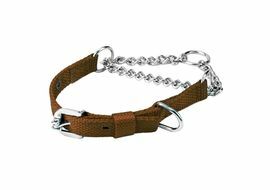 The smaller ring is inserted in the larger opening on the other end to make the perfect collar for your pet.